The stage is in pitch darkness. There's a faint sound of the sea. In the dark, Guildenstern and Rosencrantz call out to each other and, as usual, mix one another up. "Is that you?" Rosencrantz asks, and when Guildenstern says yes asks, "How do you know?" which exasperates Guildenstern. Rosencrantz pinches what he thinks is his own "dead" leg only to find out it's Guildenstern's. Sounds of sailors rise and it becomes clear Rosencrantz and Guildenstern are on a boat. They reflect that it is "dark for day" but write it off to the assumption that they've sailed north. Upstage, out of Rosencrantz and Guildenstern's sight, Hamlet lights a lantern that brightens the stage enough to see. Light reveals "three large man-sized casks on deck, upended, with lids" and an enormous gaudy beach umbrella behind them. Guildenstern observes that he's "lost all capacity for disbelief." Rosencrantz and Guildenstern have been mixing up their own identities since play's start, but this exchange provides particularly acute illustration of the way in which losing track of one's identity is akin to death: unsure of the bounds of his self, Rosencrantz worries that his leg (really Guildenstern's leg) is "dead." Underscoring the morbid mood are the three casks onstage, wooden man-sized containers reminiscent of coffins. By replacing the word 'belief' with 'disbelief' in a common phrase, Guildenstern registers just how absurd the situation has become. It seems to them that anything can happen. Rosencrantz and Guildenstern wonder what to do and decide not to move. They wonder if someone will come in. "In where?" Rosencrantz asks. "Out here," Guildenstern explains. They reflect on how much they like boats and Guildenstern is pleased that, on a boat, one needn't "worry about which way to go, or whether to go." One is, he reflects looking out at the sea (in the audience's direction), "free on a boat." Rosencrantz asks how the water is. "Rough," Guildenstern replies. Guildenstern clarifies what he meant by free: "free to move, speak, extemporize" but not "cut loose" – they are still, as ordered, taking Hamlet to England. Rosencrantz and Guildenstern's confused pronouns point to the illusion maintained by the theater – a play may treat a stage as an interior, private space but it is of course always external and public. Guildenstern sees a boat as a welcome relief from the anxiety of action on land: in the smaller, contained space of a boat, there are fewer opportunities for action and thus one needn't feel so guilty about passivity. Still, they will eventually have to disembark and return to duties on land. Rosencrantz notices Hamlet upstage sleeping. "It's all right for him [to sleep]" Rosencrantz notes. "He's got us now," Guildenstern adds. Rosencrantz wonders what they should do and Guildenstern laments that their every action is just "sifting half-remembered directions that we can hardly separate from instinct." Rosencrantz reaches into his purse for a coin to hide between his fists. He extends his fists to Guildenstern for Guildenstern to guess which one the coin is in. Guildenstern guesses correctly and Rosencrantz gives him the coin. He repeats this trip several times and Guildenstern keeps winning, growing "desperate to lose." Rosencrantz inadvertently reveals that he had a coin in each fist every time. Guildenstern asks what the point of that was and Rosencrantz responds in a pathetic voice, "to make you happy." Rosencrantz and Guildenstern's language unwittingly acknowledges the power dynamic of the situation and foreshadows the rest of the play: Hamlet is in control and will determine their fate. Rosencrantz's coin trick at first seems to be the inverse image of the play's opening coin toss: Guildenstern, who couldn't stop losing the coin toss, can't stop winning the coin trick. But when Rosencrantz reveals he had rigged the odds, the image falls flat. Guildenstern has not truly won anything. Guildenstern asks Rosencrantz how much money Claudius gave him and Rosencrantz insists "the same as you" then asks Guildenstern how much Claudius gave him. They speak in circles. Guildenstern, exasperated, demands to know why Rosencrantz doesn't ever say anything original and blames Rosencrantz for their continued stagnation. "I can't think of anything original," Rosencrantz replies, "I'm only good in support." Guildenstern loses his anger and comforts the now tearful Rosencrantz. Their exchange about payment launches Rosencrantz and Guildenstern into a typical identity mix-up, but, for the first time, Guildenstern confronts Rosencrantz outright about it. In the resulting exchange, the two end up carving out more distinctive individual identities: Guildenstern is dominant while Rosencrantz is supporting. Rosencrantz despairs that they have nothing, and Guildenstern reminds him that they're en route to England on Claudius' order, all the particulars of which Rosencrantz has forgotten. Rosencrantz asks Guildenstern about the letter and its contents and Guildenstern assures him it "explains everything." Guildenstern says "You've got it," meaning "you understand it," but Rosencrantz thinks Guildenstern means "you possess it" and panics, thinking he's lost the letter. After both get scared, Guildenstern remembers it's actually he who has the letter and remarks that they mustn't allow for such "loosening of the concentration." With the letter safe, Rosencrantz wonders why they were looking for it. Because "we thought it was lost," Guildenstern explains. There's a sense of deflation. "Now we've lost the tension," Rosencrantz notes. Guildenstern twice demonstrates his newly-declared dominant role: he explains their situation to the forgetful Rosencrantz and confirms that he is the one entrusted with Claudius' letter. Rosencrantz's comment about losing "the tension" is meta-theatrical – in theater, actors will often talk about maintaining 'the tension' in a scene (i.e. maintaining the drama: the characters' motivation for it and the audience's interest in it). Rosencrantz and Guildenstern's scenes are constantly losing conventional dramatic "tension." "We're not getting anywhere," Guildenstern exclaims. "Not even England," Rosencrantz laments, "I don't believe in it anyway." He explains that his mind remains blank when he tries to imagine the country and says that they're "slipping off the map." Guildenstern tries to look on the bright side, reminding Rosencrantz that Rosencrantz never believes anything until it's occurred, but Rosencrantz is unconvinced, saying they might as well be dead. He asks Guildenstern if death might be a boat. No, Guildenstern replies, "Death is the ultimate negative. Not-being. You can't not-be on a boat." Rosencrantz says he wishes he were dead and threatens to jump ship, thinking it'll disrupt Hamlet, Claudius, and co.. Guildenstern points out they may expect him to jump. Rosencrantz enraged by the futility of the situation shouts, "All right! We don't question, we don't doubt. We perform." Still furious, Rosencrantz demands to know what they're going to say to the King of England and Guildenstern launches into a role-play with Rosencrantz as King of England and Guildenstern as Rosencrantz and Guildenstern. In the course of this role-play, Guildenstern presents the letter and as Rosencrantz reads it aloud they realize it orders Hamlet's beheading. Rosencrantz and Guildenstern separate onstage, stand in silence, then remark on the weather. After another pause, Rosencrantz points out, "We're his friends," but Guildenstern points out they only have others' word on this. The play's climax. Light-heartedly acting out other identities, Rosencrantz and Guildenstern are unexpectedly snapped back into the full confusion and anxiousness of their selves. They realize that they have all along been Claudius' execution assistants. As usual, their instinct is to act passively, ducking responsibility. Still, Guildenstern is correct to say they have no personal experience of being Hamlet's friends. Guildenstern long-windedly justifies letting Hamlet be killed – he would, being mortal, have died anyway, and is just "one man among many." Besides, he goes on, death could easily be "very nice" and it's a release from life's burdens. He adds that he and Rosencrantz "are little men" and shouldn't "interfere with the designs of fate." He concludes that they shouldn't intervene to save Hamlet. When Rosencrantz questions this conclusion, he urges Rosencrantz not to "apply logic" "or justice." Rosencrantz describes "the position as I see it" by recounting a list of the action of the play thus far. Then concludes, "Good. We're on top of it now." Hamlet blows out the lantern and the stage goes black. Then moonlight appears to show Rosencrantz and Guildenstern asleep. Hamlet creeps up and removes the letter from them, reads it behind the umbrella, then replaces it with a different letter. This moment marks a defining turning point in the play: though the play's trajectory has been pre-scripted by Shakespeare's Hamlet, Rosencrantz and Guildenstern themselves are ignorant of that fact and so, for them, this moment presents a real opportunity for action. They could choose to try and save Hamlet's life. But Guildenstern's speech holds them back from any such action, justifying passivity with arguments that use the rhetoric of rationality but are really just cowardice disguised. Morning rises on Rosencrantz and Guildenstern with Hamlet behind them reading on a deck chair beneath the umbrella. Rosencrantz announces he's "assuming nothing" and describes "the position as I see it." This time it's a list of all their assumptions: the direction of the ship, the fact that Claudius paid them equally, the idea that they don't know what's in the letter and that they'll hand Hamlet over to the English King and then be finished and "at a loose end." He is mildly pleased with this list and says they could have done worse and that he doesn't think they "missed any chances." Though Rosencrantz claims not to be making assumptions, he assumes broadly, thus inadvertently subscribing to the Player's worldview (to act on assumptions). Their refusal to act to save Hamlet could also be seen as inadvertently adopting the Player's cynicism. Guildenstern's satisfaction is ironic – they have just missed the largest chance of all: the chance to try and save a life (at least for a time). A recorder sounds and Guildenstern, excited, calls it a sound "out of the void" and the promise "that something is about to happen." It is a sailor piping, he says, and "could change the course of events." He tells Rosencrantz to go investigate. Rosencrantz procrastinates, then finally hunts around for the source of the music and tracks it down (to his great befuddlement) to the middle cask onstage. Music starts to come from the other two barrels and resolves into the familiar tune of the Tragedians. Rosencrantz, anguished, cries out "Plausibility is all I presume!" and the Player cheerfully pops out of a barrel followed "impossibly" by the Tragedians in the costumes they wore for the dumb-show. Guildenstern is excited to welcome a new character who would be a sign of a new reality, and would imply that they've truly left their old sphere behind. Yet the return of the Tragedians' reveals that Rosencrantz and Guildenstern are still firmly grounded in the groundless and absurd world they've occupied since play's start. The Player explains to Rosencrantz and Guildenstern that they had to hide in the barrels to escape as stowaways after Claudius was offended by their play and stopped it. They couldn't pay their way as no one ended up paying them for the play and they lost so much money "betting on certainties. Life is a gamble, at terrible odds" the Player says, "if it was a bet you wouldn't take it." He asks Rosencrantz and Guildenstern if they're surprised to see the Tragedians. Guildenstern says he'd known it wasn't the end. "With practically everyone on his feet," the Player adds. Again, the Tragedians' play parallels the play-within-a-play in Hamlet, which infuriates Claudius and is shut down. The Player's seemingly absurd quip about life is, upon reflection, profoundly accurate: life tries to preserve itself - to win out over death - but death wins 100% of the time. To bet on life, then, is to bet on a certainty, to make a losing bet. The Player furthers that idea with his quip that it certainly can't be the end if everyone is still standing. Things always end only one way, for everyone: with everyone dead. The Player asks Rosencrantz and Guildenstern if they've spoken with Hamlet. They reply: "it's possible" but "pointless." Guildenstern explains that they are without restrictions and can speak whatever they like to whomever they like – "within limits," Rosencrantz adds. The Player, Rosencrantz, and Guildenstern watch as Hamlet comes downstage, spits into the audience, and wipes off his eye as if spit on in return. Hamlet goes back upstage. Rosencrantz and Guildenstern's description of their lightly constrained freedom is wishful thinking and shows how ignorant they are of their own pre-scripted fates. By having Hamlet spit into the audience and get spit on in return, Stoppard jokily demonstrates what the "limits" on free speech that Guildenstern refers to might be. There are lines that an actor in a play can cross that will make the audience become active participants in the play. An spit upon audience member likely will, for instance, spit back. Rosencrantz describes Hamlet's condition: "A compulsion towards philosophical introspection…It does not mean he is mad. It does not mean he isn't. Very often, it does not mean anything at all." Guildenstern lists a long list of his symptoms ("pregnant replies, mystic allusions," "invocations of camels, chameleons, capons," "stabbing his elders, abusing his parents" etc.). "And talking to himself," Rosencrantz adds, and Guildenstern repeats. They move off and converse among themselves in fragments recounting the Player's situation: offending Claudius, dodging arrest, meeting Rosencrantz and Guildenstern taking Hamlet to England, etc. Rosencrantz, indignant, complains that all they get is "incidents" and longs for "a little sustained action." Rosencrantz's description of Hamlet's condition evokes the Player's earlier description of the drama itself as "meaninglessness" out of which people may "extract meaning." Rosencrantz and Guildenstern go into a huddle as if making a plan of action but they in fact only list off facts, passive as ever. They don't even offer opinions. Again, Rosencrantz finishes by offering a metatheatrical critique of the scene he's in, by treating himself as an actor even though he, as a character, does not think he is an actor (but, of course, really is an actor). At that moment, pirates attack and everyone on stage runs around frantically shouting with swords out in a great hullabaloo. Eventually, Hamlet, the Player, and Rosencrantz with Guildenstern jump into the three barrels on stage to hide. Lights dim, sound fades out, and lights rise again revealing that the middle barrel (in which Rosencrantz and Guildenstern had hidden) is missing. Rosencrantz and Guildenstern emerge from the right-hand barrel. The Player emerges from the barrel Hamlet had hidden in. Noticing Hamlet is gone, Rosencrantz and Guildenstern panic and question whether he's dead or if he'll come back. The Player calmly deflects their questions. Rosencrantz and Guildenstern are hysterical as they fear they'll never escape their own situation without having Hamlet to turn over to the King of England. The Player calmly advises them just to turn in the letter anyway. The Player then turns away and lies down. As if the punch line to a theater joke, Rosencrantz's complaint that the scene lacks "sustained action" is immediately met with the frenzied hyperactive scurry of a pirate attack. (Though this attack is actually scripted into Hamlet – it's not performed on stage in Shakespeare's play but is alluded to). Once again, Hamlet has eluded Rosencrantz and Guildenstern's grasp. Fearing that they could only escape their absurd reality by turning Hamlet in, they despair. Lying down, the Player makes a theatrical half-exit: he is absent from the drama though present physically. Rosencrantz tries to make conversation about the weather but Guildenstern shouts at him to shut up. "Do you think conversation is going to help us now?" he demands. Rosencrantz tries to strike up talk again, this time by betting Guildenstern all his own money that his birth year doubled is odd. Guildenstern moans, then strikes Rosencrantz down. Guildenstern reflects in a broken voice that they've "travelled too far…momentum has taken over; we move idly towards eternity, without possibility of reprieve or hope of explanation." Rosencrantz commands Guildenstern to at least be happy since they survived. Picking himself off the ground, he suggests they just go on to England and report to the king as planned. Guildenstern balks, saying he doesn't believe in England and that they'll have nothing so say to the king. Rosencrantz and Guildenstern's relationship begins breaking down as Rosencrantz's efforts to please Guildenstern fall flat and Guildenstern turns violent against him. Guildenstern's description of their situation proves an accurate account of the universally absurd experience of human mortality: propelled by life's momentum, moving involuntarily but inexorably towards death. Where earlier it was Rosencrantz who lost his belief in England, now Guildenstern loses it as he gives up all hope of escaping their situation. Rosencrantz, trying to convince Guildenstern they can still go through with the plan, points out they still have the letter, which Guildenstern snatches from Rosencrantz and reads aloud. It orders Rosencrantz and Guildenstern's execution. Rosencrantz and Guildenstern reread it in speechless shock. The Player rises and kicks his barrel shouting into it "they've gone!" The Tragedians emerge and form "a casually menacing circle" around Rosencrantz and Guildenstern. Hamlet must have replaced the letter when he secretly read it earlier in the act. Just as they must suddenly confront their imminent death, Rosencrantz and Guildenstern are surrounded by a "menacing" circle of actors. The ring of actors can be seen as a metaphor for the noose of the drama, Hamlet, that has pre-scripted Rosencrantz and Guildenstern's all along, or the noose of life, which always ends in death. "Where we went wrong," Guildenstern says quietly, "was getting on a boat. We can move, of course, change direction, rattle about, but our movement is contained within a larger one that carries us along as inexorably as the wind and current…" Rosencrantz reflects that the others must have planned for their death from the beginning – "who'd have thought that we were so important?" Guildenstern is in anguish, wondering who they are that their deaths should be important. "Who are we?" he asks the Player, who responds with their names. When Guildenstern protests that's not enough explanation, the Player retorts, "In our experience, most things end in death." Again, Guildenstern's description of his and Rosencrantz's situation ends up describing the universally absurd human experience of mortality: within the context of a life, a human being can "move…rattle about" but no one can affect or impede his life's "larger" movement towards death. Rosencrantz and Guildenstern are unable to reconcile their own senses of identity with the immense ("important"-seeming) abstraction of death. With "fear, vengeance, scorn" Guildenstern balks at the experience of "actors" and grabs a dagger from the Player's belt that he holds at the Player's throat. Guildenstern makes a speech saying he's talking about death "and you've never experienced that. And you cannot act it." He pushes the blade into the Player's throat to the hilt and the Player clutches at the wound, weeps, and falls to his knees dying. Guildenstern announces to the Tragedians' that this was the Player's destiny and that if there were no explanations for Rosencrantz and Guildenstern, there should be none for the Player either. Guildenstern's fury at the insufficiency and falseness of theatrical death fuels his first proactive action in the play. Having the missed the opportunity to act to try and save Hamlet's life, Guildenstern suddenly acts to kill the Player. Yet he immediately shirks responsibility for that action, claiming it was just the Player's destiny. After the Player lies silent, the Tragedians applaud appreciatively and the Player rises. "You see," he tells Guildenstern, "it is the kind [of death] they do believe in." He reveals the dagger he was stabbed with has a trick blade. "For a moment you thought I'd—cheated," he says. Rosencrantz laughs nervously and applauds. The Player animatedly advertises all the deaths the Tragedians' can perform ("Deaths for all ages and all occasions! Deaths by suspension, convulsion, consumption" etc.) while the Tragedians' mime them upstage. Light fades on them. Guildenstern's one proactive action proves ineffectual and ends up contradicting the very point about death he killed the Player to demonstrate. An acted death can, as the Player proves, be believable, and Guildenstern, who claimed otherwise, has just believed one. The clarification about the trick blade establishes that, though the world of the play may be absurd, the humans in it are still mortal. In an exhausted but still impatient voice, Guildenstern protests that death isn't like that "for us," that it's not "romantic" or "a game," that it's "not anything…is not…It's the absence of presence…a gap you can't see." Upstage is now entirely dark, leaving only Rosencrantz and Guildenstern visible near the front of the stage. Rosencrantz's applause falters and stops. Rosencrantz speaks, wondering what it was all about, asking why they couldn't "just stay put," crying that they've "done nothing wrong!" "didn't harm anyone. Did we?" Guildenstern says he can't remember. Rosencrantz, resolved now, says he doesn't care and is in fact relieved. Rosencrantz disappears but Guildenstern doesn't notice at first. When he does, he starts to call Rosencrantz's name, then his own. "Well, we'll know better next time," Guildenstern says, "Now you see me, now you—" and disappears. Yet in spite of having just been fooled by the Player's acted death, Guildenstern still maintains that death is unknowable, isn't actable. The utter unimaginability of death makes the absence of description ("a gap you can't see") the best possible description of it. 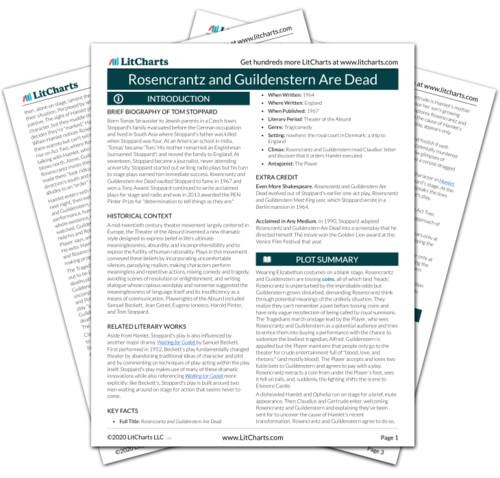 Indeed, both Rosencrantz and Guildenstern's deaths are marked by each man's sudden disappearance, evoking Guildenstern's earlier characterization of death as "a man failing to reappear." Rosencrantz is at first upset by death's senselessness - that neither the events of their lives nor the fact of their deaths seems to be "about" anything specific. Yet unable, of course, to resist death, he vanishes. "Immediately" the entire stage lights up and reveals the corpses of Claudius, Gertrude, Laertes, and Hamlet sprawled in court as in the last scene of Hamlet. The corpses are in the same positions that the Tragedians' bodies were when they were playing dead. Horatio holds Hamlet while Fortinbras stands by with two ambassadors from England. Speaking actual lines from Hamlet, one ambassador regrets having come too late to report to Claudius that, as ordered, "Rosencrantz and Guildenstern are dead." Horatio replies that Claudius never ordered their deaths. Horatio calls for "these bodies high on stage be placed to the view" and announces that he'll recount the events that brought this bloodbath about: "so shall you hear of carnal, bloody and unnatural acts," he says, "of deaths put on by cunning and forced cause, and, in this upshot, purposes mistook fallen on the inventors' heads." As Horatio speaks, the lights fade out and the play is overtaken by dark and music. The play ends with the bloodbath that concludes Hamlet and that the Player has alluded to all along. Shakespeare's script, which Rosencrantz and Guildenstern have experienced throughout the play as a non-negotiable force of control, has, as predicted, prevailed over them and commands the stage even after they've disappeared. The uttering of Stoppard's play's title by the English ambassador (combined with Horatio's promise to pass on the story) suggests a return to the play's beginning, triggering a potentially endless cycle of repetition (which is, of course, literally accurate: this play will be performed again and again). Guildenstern's penultimate words ("we'll know better next time") could be read as an allusion to the next production. And, of course, they won't know better: they'll do all the same things, be just as controlled by the play, and they will die. Ross, Margaret. "Rosencrantz and Guildenstern Are Dead Act 3." LitCharts. LitCharts LLC, 18 Dec 2013. Web. 18 Apr 2019. Ross, Margaret. "Rosencrantz and Guildenstern Are Dead Act 3." LitCharts LLC, December 18, 2013. Retrieved April 18, 2019. https://www.litcharts.com/lit/rosencrantz-and-guildenstern-are-dead/act-3.